MYRTLE BEACH, S.C. - Three people were killed and two others were wounded in two separate shootings in Myrtle Beach, one of South Carolina's most popular tourist destinations. The fatal shooting took place around 11 p.m. Saturday in front of crowds of tourists at the Bermuda Sands Motel along the beach's new boardwalk, Myrtle Beach Police Capt. David Knipes said. "We've got detectives working on it around the clock," Knipes said Sunday. "We don't have any suspects in custody." Knipes would not say whether detectives have determined a motive for the shooting, but said it didn't appear to be a random shooting. CBS affiliate WCSC in Charleston reported that Deputy Coroner Darris Fowler has identified the victims as Devonte Dantzler, 21, of Summerville, S.C.; Jamie Williams, 28, of Ladson, S.C.; and Sandy Gaddis Barnwell, 22, of Summerville, S.C. All three deaths were ruled homicides. The fourth shooting victim, identified as Keith Williams, was hospitalized. Hiss condition was not known. About 90 minutes earlier, a man was shot in a separate incident on Ocean Boulevard, WCSC and the Sun News said. The victim was taken to the Grand Strand Medical Center, His condition was not immediately known. On Sunday, thee area around the motel was busy with tourists about 12 hours after the shooting. Tourists who were asked for comment declined to speak to a reporter because a suspect was still at large and they feared retribution. The Sun News quoted a witness as saying that several people were fighting on the sidewalk in front of the motel minutes before the shooting. "At first, everyone was standing around to see who was going to win the fight. Then they started shooting and everyone scattered," George Covington told the newspaper. 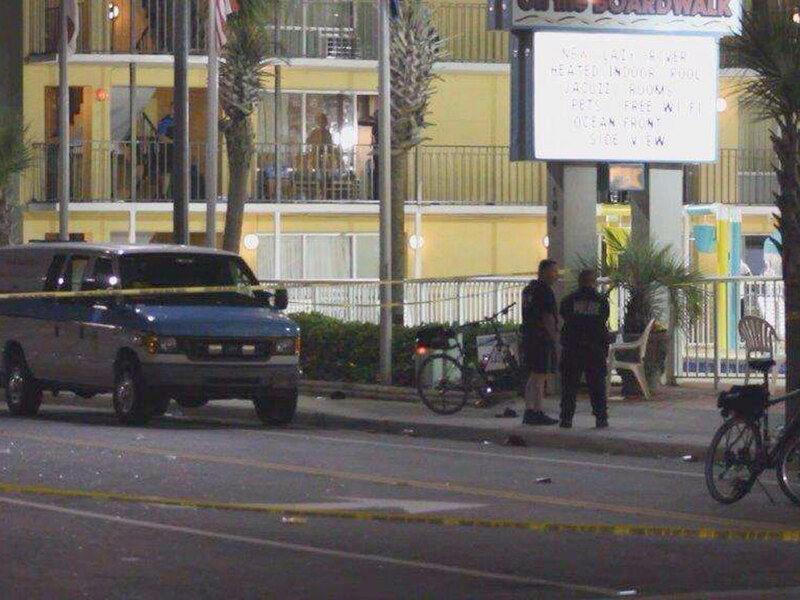 The shooting happened during the annual Atlantic Beach BikeFest held about 15 miles away during the Memorial Day weekend. Police say they typically deal with motorcycle wrecks and lesser offenses during the bike rally, but violence is unusual.